Intec's infinity series is revolutionary! 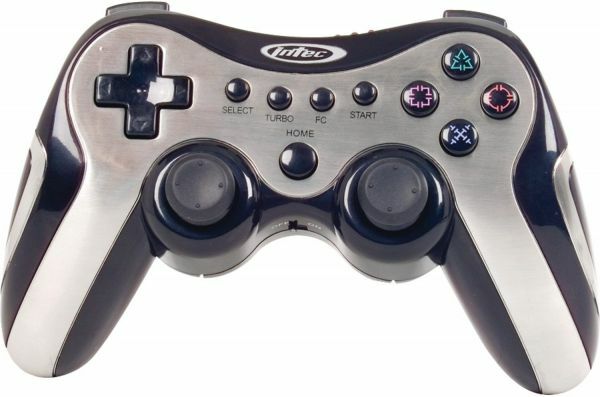 This controller features 2.4GHz wireless technology that allows you to play up to 20 feet away from your console with no interruptions, while supporting up to 20 players in one room. Up to 60 hours of game time on 3 AAA batteries and a built-in auto shut-off feature that will save your battery life when not in use. The dual action (analog and digital) gives an unmatched control while the turbo function gives you instant auto-fire or repeat capabilities. It has a built-in motor and low voltage battery LED indicator lets you know when to replace batteries.